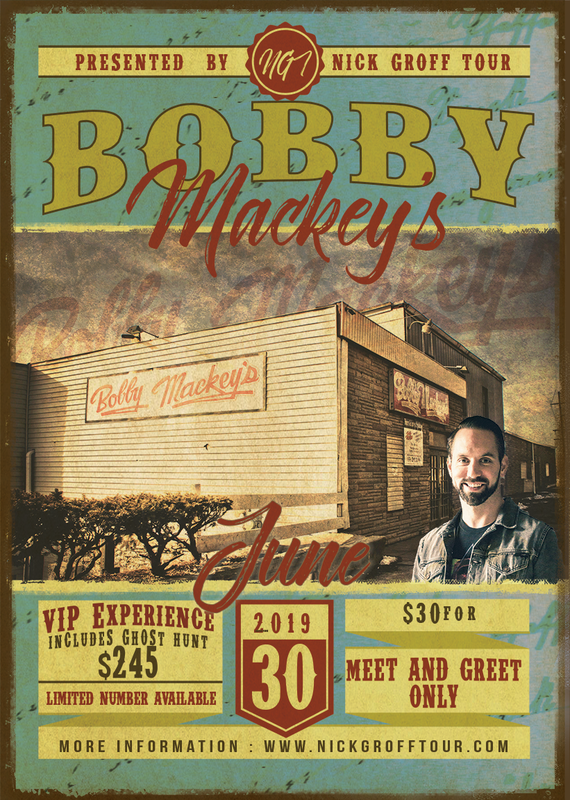 In February 2015, we made our first ever stop on the Nick Groff Tour at Bobby Mackey's Music World. The spirits did not disappoint that night. Experiences were had and the Nick Groff Tour was born. Since that first event, fans from all over the world have joined Nick and the NGT crew at haunted locations across the US, communicating with spirits and having experiences to last a lifetime (and perhaps beyond...) Now. we are taking a journey back to the place that started it all, a place that Nick once said that he would never return to, and you're invited to join us. Since that time, Nick has been back to Mackey's multiple times, including to film an episode of Paranormal Lockdown that resulted in some of the most incredible video footage ever captured. Don't miss out on this opportunity! get locked down with Nick Groff (and maybe a surprise guest or two!) inside Bobby Mackey's. In addition, our VIPs get to attend a Q&A session and Meet & Greet. As a VIP ticket holder, you will also receive an autographed 8X10 photo, exclusive event t-shirt and VIP badge, and professional photo op with Nick (digital download). Not interested in the investigation? We also offer a Meet & Greet only ticket. The Meet & Greet ticket includes an autographed 8X10 photo as well as the opportunity to meet Nick and take photos with your phone/camera.